It’s a jungle out there with a lot of people that want to take your money. 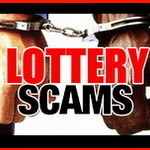 Lottery scams are increasing just because they rely on people’s natural desire to win. Some of them are darn right professional looking where others are so badly put together; it’s a wonder they scam any money. The big thing is to understand how they do it and make sure you don’t get caught in their web. Email has undoubtedly increased the amount of money that scammers are taking. 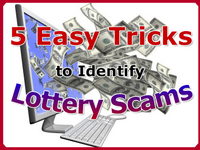 So let’s look at five easy tips on how to identify lottery scams. But hang on, I didn’t play! Seriously folks. If you didn’t enter a lottery, then you can’t have won. Even if someone purchased a ticket on your behalf, the lottery would not know your name. Why do you suddenly believe you’ve won a lottery? One of the biggest scams that are used by telephone, email and snail mail is the scammers that say you’ve won a lottery. There is no lottery unless you are using a professional online lottery service that is going to contact you to tell you that you have won! If it is a big jackpot, they will contact you by telephone, and you can verify it through your account. If you haven’t bought a ticket, then you haven’t won. These folks operate the scam by either asking for fees up front to process the win or identity theft. Don’t buy into it! There is no question that one of the biggest scams is through email. It’s cost effective as they can send out hundreds of emails and even if 1% bite, they make good money. Firstly, unless it’s an online lottery provider that you’d signed up for, no one is going to contact you by email to say you’ve won. Secondly, simply take a look at the email address. 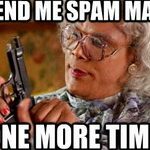 If it is Gmail, Hotmail, Yahoo or some other generic free email address provider, then stop now. Do not go any further. If you feel like doing a good deed, forward it to the actual lottery represented. That also goes for snail mail stuff where someone is acting as an ‘agent’ for a lottery. Most lotteries will rely on YOU checking your numbers and getting in touch with them. But I Need Help! I Won! One of the biggest lottery scams being run in the US is people that approach in parking lots and other commercial areas saying that they’ve won but they are not a US citizen (either Mexican or from the islands in the Caribbean) and they need help. They are either offering their ticket for a sum or offering a percentage with some cash up front. Don’t go there. Anyone can collect on a US lottery. They have to pay a larger federal tax, but that’s the way the game is played. This has probably been one of the most popular scams the last while. It plays on a combination of our natural greed – I mean we all want to win – plus trying to be a good Samaritan and help the person out. We all hear about the different systems that are used in casinos, and the best of all is card counting. 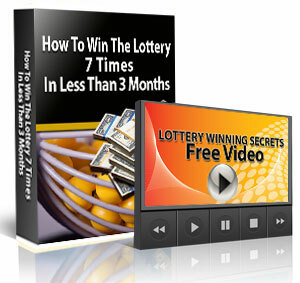 Many lottery scammers offer a variety of systems, programs, and software that will give you the edge on ‘the game’. To date, no lottery system will nail the jackpot lottery. There are different arguments on different systems that increase the odds. It’s agreed that playing syndicates and more tickets increase probability odds. But, it’s still a crap shoot on getting the full five or six numbers including the bonus ball to get that big jackpot. Some people figure that playing the same numbers increases the odds. Some people figure that playing quick picks does this. The simple fact of the matter is that most of the systems offered whether computerized or books simply are making their money by selling. 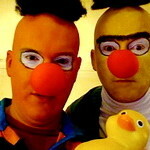 Be very careful of anyone that is selling the best way to win – why don’t they win! There has not been one person we have found offering a system that has consistently won any lottery. There are some that offer an increase in probability odds. Playing in a syndicate does increase the odds as the more tickets you have, the more chances to win. Let’s say that the idea of paying for a system is money better spent on actual lottery tickets. Some of the sites used to scam lottery players offer so much that people don’t bother reading the small print. How does it work? They offer free giveaways, prizes and free lottery tickets to get your details and/or credit card number. Somewhere in the small print is the fact that you have signed up to an ongoing subscription and suddenly your credit card is being charged copious amounts of money. Some of these scams include on-selling your details, and suddenly your email address is full of spam. If it looks too good to not to play, make sure you look at the small print and see what you agree to. 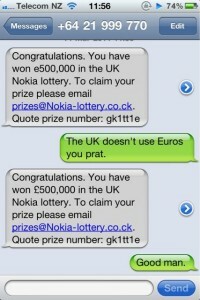 Any lottery offered online that is free has to be making its money somehow. Just make sure that you’re not the one that is paying the price! There are lots of great jackpot lotteries out there to play. If you want to play internationally, online lottery providers are great and make it easy. Find one that you feel confident about and enjoy your chances of winning.